Matching fans are in for a treat should they decide to take City Birds for a spin. This game is pure casual action fun that’s not quite like anything I’ve played before on my iPad, and given the amount of games I have played, that says quite a bit. It’s easy to learn and quickly gets addictive. The problem is that once you’ve unlocked all the birds and completed all the challenges, which sadly doesn’t take as long as one would like, the game grows kind of stale. Hopefully updates that are in the works will address this issue so that this original game can remain fresh to its players for quite some time. Your job is to rescue birds from the perils of crowded city life by capturing them so they can be transported to wildlife preserves. To do this you simply drag the birds from the air into cages that match the color of the bird. If you rescue multiple birds of the same color in a row you’ll get a color bonus which means extra coins. 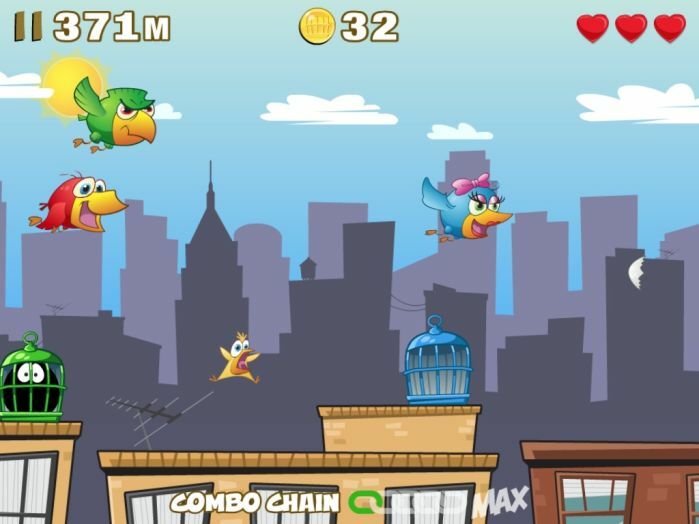 There are also three different levels of bird for each color, each of which gives you more points and coins than the last. There are missions to complete that will help raise your combo multiplier, and the coins you earn will allow you to unlock the bonus birds that were mentioned before. 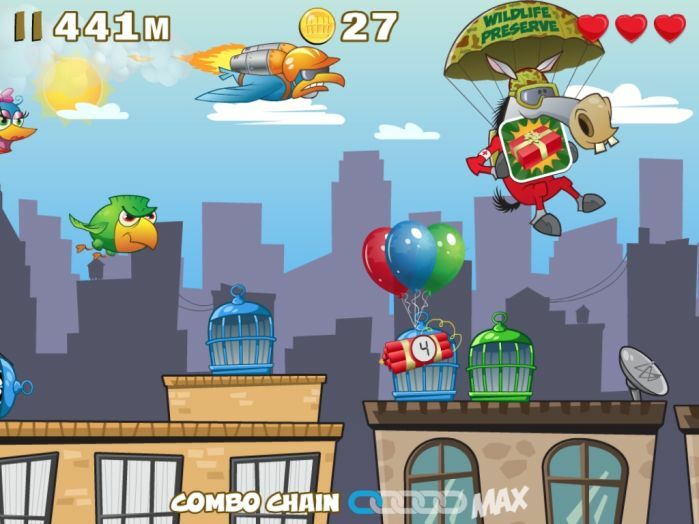 Occasionally a horse will fall from the sky (don’t worry, it has a parachute) that when tapped gives you a temporary bonus like making all birds the same color for some great bonuses. So that the game isn’t a walk in the park, there are plenty of things to try and stop you. Balloons with dynamite float up from the bottom of the screen, and if you don’t swipe the balloons before the timer goes off the dynamite explodes and you lose a life. Wayward eggs that hit a cage before you can tap them cost you a life, regardless of whether the cage is empty or full. The biggest challenge is that the birds are constantly in motion, and if one flies off the screen you lose a life. Thankfully you can drag them away from the edge of the screen, but this can become quite a juggling act when you have lots of birds and few cages showing up. Then you add in the birds that come zooming by on jet packs and you’ll wish you had about 10 more fingers. The biggest problem with the game is lack of variety. There are only a couple of deterrents and two types of birds, the normal fliers and the jet packers. This leaves you with the challenges to complete and the birds to unlock, but neither of those took as long to finish as I had hoped. Now the only thing I’ve got to work toward is earning a new high score, which is not something I really care about. I’ve already heard rumors that new birds are coming, but hopefully they’ll actually add to the game play instead of just being something else to unlock. I’d also like to see unlockables besides the birds and more challenges to take on. Finally, I could see this game having a really interesting two-player mode where you can use the money you collect during the game to launch extra obstacles against your opponent. There’s a real Saturday morning cartoon vibe where the graphics are concerned. The birds are well designed and the animation is decent. Backgrounds are multi-layered with a nicely detailed foreground layer and a couple of generic silhouetted background layers to add some depth to the look. The music is enjoyable though there is only one song that plays throughout the game, and the sound effects are decent, but sadly the birds themselves really don’t make any noises. Like many of the games I play that aren’t the umpteenth installment in a saga and don’t receive the hype that games from big publishers do, I was pleasantly surprised with what City Birds had to offer. The mechanics were fresh, the audio and visuals were fun, and while it lasted I enjoyed completing the missions and unlocking new birds. 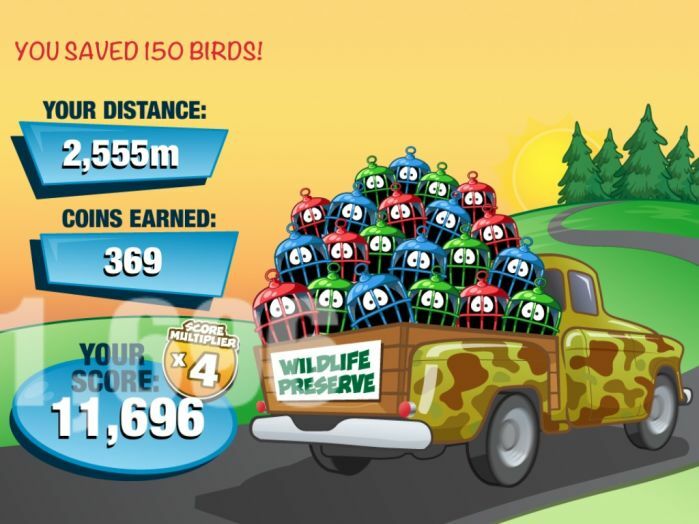 If you’re more into the unlocks and missions than chasing high scores you might find City Birds a bit lacking, but I’m keeping my fingers crossed that future updates take care of that concern.